As you all know by now, we’re making over Chez Gallagher one room at a time. When the time comes for my kitchen to get an overhaul, I plan to also totally revamp our command center. 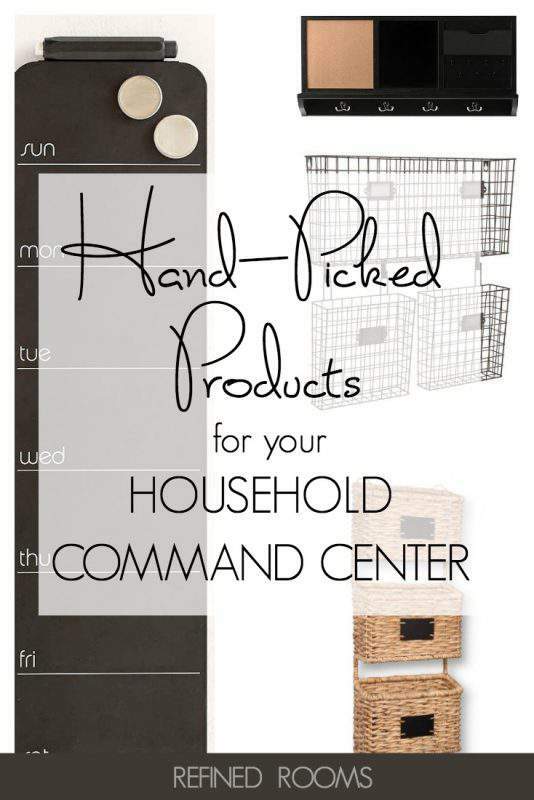 Since this week’s assignment in the Organize and Refine Your Home Challenge is to create a (or tweak your existing) household command center, I thought it might be useful to share some awesome household command center products that I came across while researching ideas for my own command center redesign. Love something you see? Click the numbered links below each collage for more details about the products! Since one of the basic functions of your command center is to store a variety of household papers, wall bins are an important product category to start with. 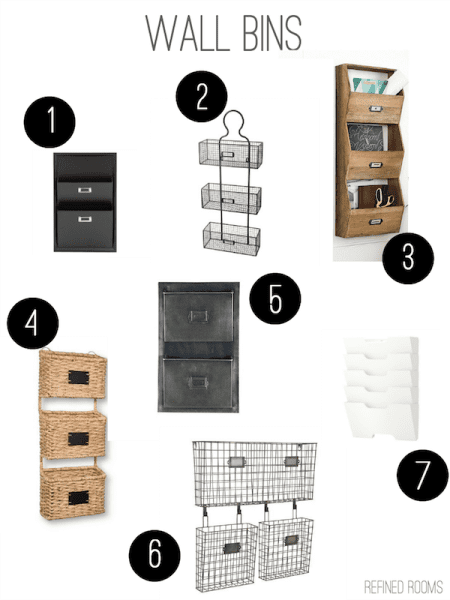 Lucky for us, there’s such a variety of great wall bins to choose from! With the selection of choices below, it’s easy to match your design aesthetic and achieve the functionality you need for your household. The command center serves as the central communication hub for your household. So it makes sense to include some form of family calendar (weekly or monthly), as well as a tool for sharing information among family members. The command center is a great place to store and charge everyone’s devices too. Including a charging station in your command center helps to hide the cord mess and keep the flat surfaces clear. If your household has as many devices as mine does, you may need to incorporate more than one of these into your command center design! I’ve been drooling over several of the modular wall systems that are on the market since I first laid eyes on them several years ago (I’m thinking there will be a Pottery Barn Daily System configuration in my future!) The beauty of modular wall systems is that you can pick and choose among all of the matching component parts to customize a system that works specifically for your family. 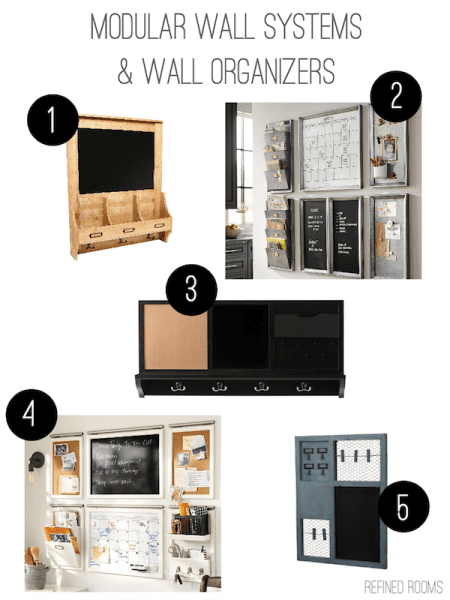 In my search for products, I also came across wall organizers that combine several of the storage/functionality elements into one gorgeous piece (e.g. message board & wall bin combo) that would look great no matter where your command center lives in your home. 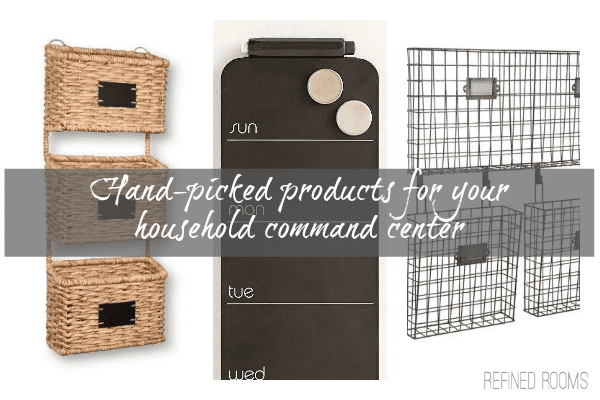 For those of you participating in the Organize and Refine Your Home Challenge, I can’t wait to see how you incorporate these household command center products into your home! Remember to share photos of your completed project via Instagram (use the hashtag #OrganizeandRefineChallenge and tag me @refined_rooms)! Love these picks! A good command center is vital to a well-functioning home! Thanks so much for linking up with us at Funtastic Friday! Thanks for your feedback Liz! and I totally agree! These are really great yet simple to implement, ideas! Thank you. The worse thing for me is making a project out of organizing. But your recommendations are simple and I’ll see quick results which will help in the process. Yes, organizing “projects” can be bite-sized (in fact, they’re much more likely to get done if they are!). Progress, not perfection! Love all these ideas. I have been going back and forth on doing a command centre but was always stuck on what to buy. Thanks to your ideas it has helped me picture it more. Thinking this will be my next project. I’m so glad you found the post helpful Sandy! Be sure to come back and leave a link to your site if you do a blog post on your command center once it’s completed! 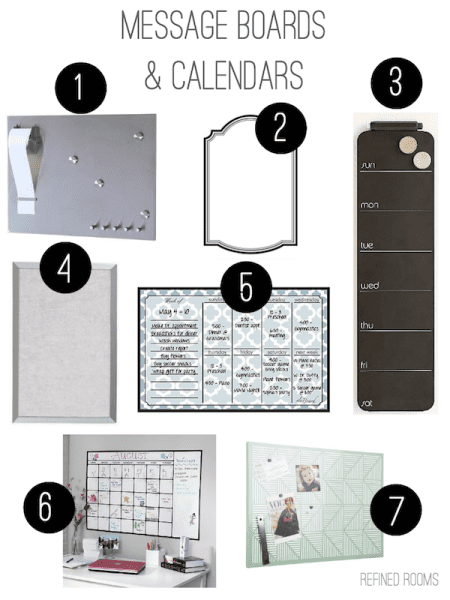 Since I use the Thirty One wall organizer myself, of course I wanted to include that product, but alas, Thirty-One has discontinued it for some reason 🙁 My kids are past the laminated chore/behavior chart stage, but the command center would definitely be THE place to store these when we used them. Look forward to your post! Great products and I love the way you visually “shared” the info with us! Lots of great ideas and tools to help keep our Command Centers organized and functional! Thanks Natalie! I’m glad you found the round up useful Liana. Thanks for stopping by! 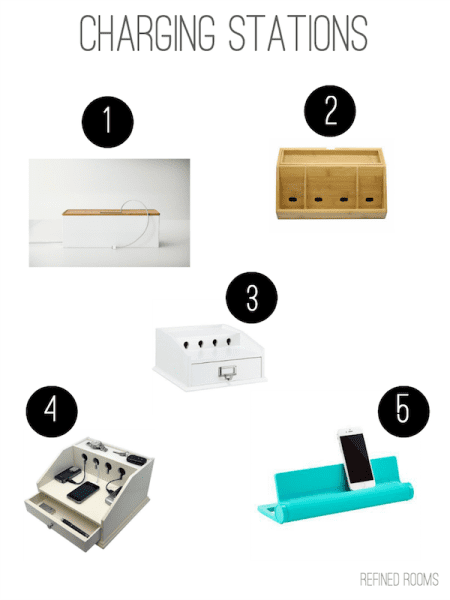 My first thought was that I don’t need any of these things, then I saw the charging stations – wow! I love my charging station because I made it myself and it doesn’t look like a charging stations. In my old kitchen, I had a lot of wall space so the wall mount systems worked great for me. Oooh, I’d love to see a photo of your homemade one Sabrina. Do you have it featured in a blog post per chance?